Steamed rice with tomato drumstick curry is a lovely finger licking good combination. Tomato Curry is the simplest curry recipe for most of the moms, I think. In my school days, my mom used to pack my lunch box with tomato curry, omelet, and a condiment to accompany with steamed rice. Those days I hate this combination especially the tomato curry. But these days, I feel very nostalgic and miss my mom badly, whenever I make tomato curry. 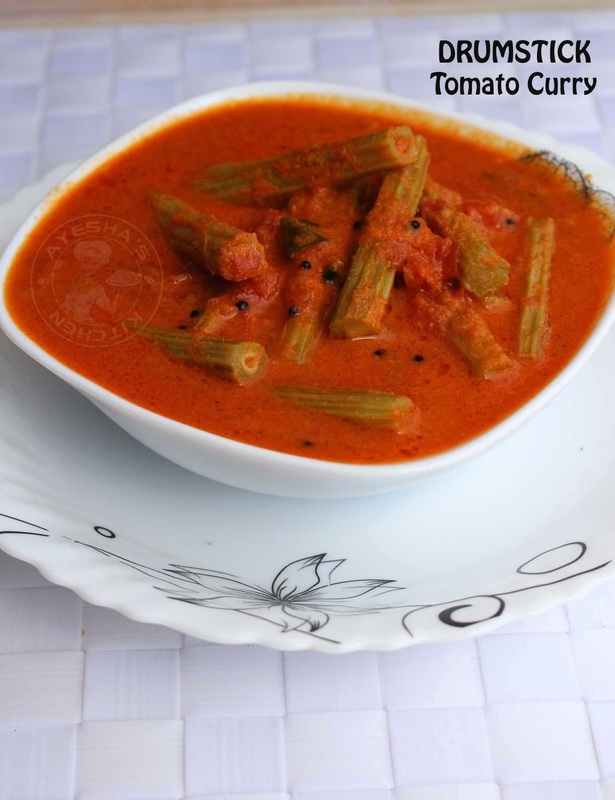 I also add drumsticks, okra, bottle gourd in my tomato gravy or tomato curry to it more delicious. Here am with a tomato drumstick curry which pairs best with steamed rice. Drumstick plant has got several health benefits. As this moringa/drumstick is healthy and tasty I prefer making curry recipes with moringa/drumstick more often. Moringa leaves curry with dal is my favorite. Like so we can make stir fry recipes with moringa leaves (Moringa leaves stir fried / drumstick thoran). Sometimes the moringa flower is stir fried to make some thoran recipes. This tastes super delicious. 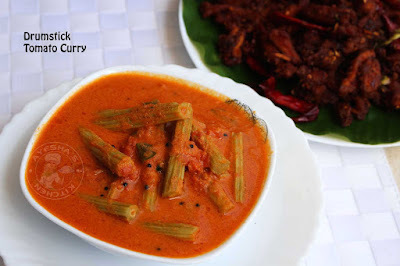 I used to add healthy vegetables in our diet by making the curry of the same along with this veggie drumstick. Shrimp curry with the drumstick is a wonderful curry recipe from the gods own country. You can check my blog for various curry recipe with the veggie drumstick. Hope this vegetable curry recipe will make your lunch meal more delectable. Grind together scraped coconut, cumin seeds and chili powder along with some water to a fine paste and set aside. Heat a wok with oil. Add shallots sliced and saute until light. Then add sliced tomato along with chili powder and salt. Saute it and let it cook covered until tomatoes turn mushy. When done, add tamarind pulp. Stir well to combine. Let it cook for a minute. Now add the drumstick pieces and give a fine mix. Then add the ground coconut paste. Mix well. Let it cook until the drumstick is done. Check occasionally. Add hot water is required and check for salt. When the curry is done, remove from flame. Heat a pan with oil. Splutter mustard seeds and then fry curry leaves. 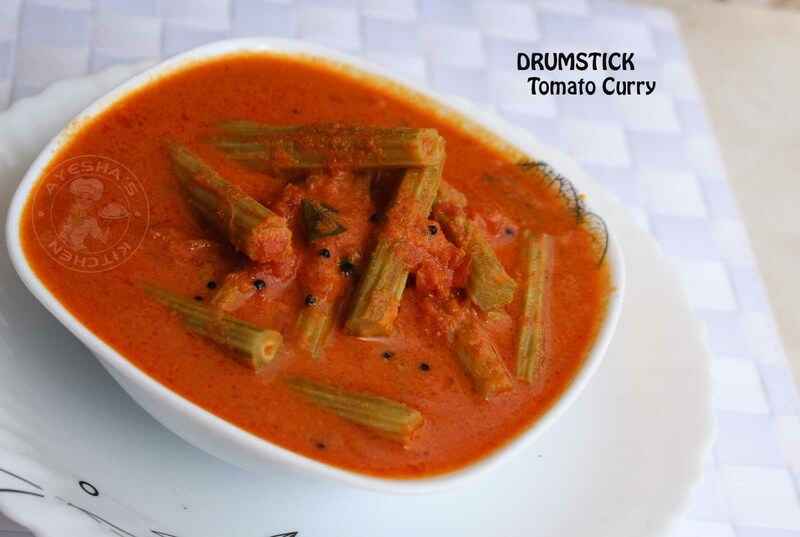 Delicious tomato drumstick curry is ready to serve. Tastes best with steamed rice.